Mostly so I don’t forget: this beef rendang recipe was sensational. I tweaked it a lot — no chilis because my wife and kids don’t eat spicy, no fennel seeds because I have no fennel seeds, and I cooked it in the crockpot, which made the texture more like a rich beef stew than classical rendang. But it tasted great and both children were into it, so into the rotation it goes. Recipe: Preheat oven to 450. Scrape corn kernels off the cobs. Melt butter in pan, add flour, cook until it is roux. Add a little more butter if needed and saute diced onion and garlic about 5 min until soft. Add milk and kernel-less cobs. Remove ribs and seeds from jalapeno and add it whole. This is going to simmer about 30 mins. and meanwhile you are cutting up the sweet potato and red pepper and scallion and roasting them with the corn kernels until everything is slightly charred and smoky. That being done, take some of the sweet potatoes and puree them with some soup to make a nice orange-brown paste. 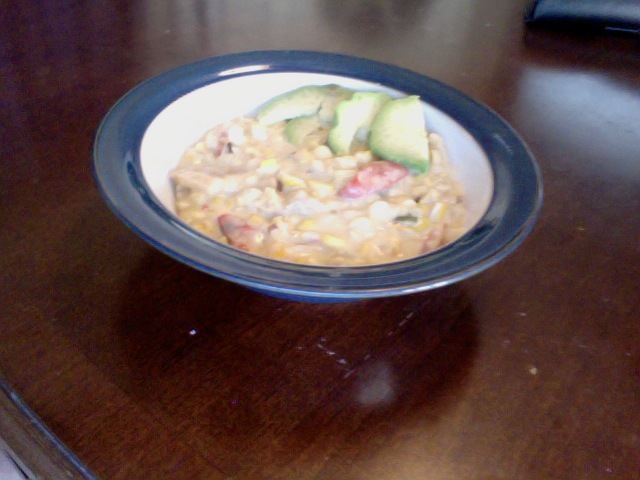 Throw out the cobs and the jalapenos and put the sweet potato paste, red peppers, corn, and scallions in the soup. Heat through, season with salt, pepper, cumin to taste. Notes: It’s not clear to me that the jalapeno added anything. Also, it was too thick; next time I might skip the roux. Update: Skipped the roux, dropped the jalapeno, added a chopped/seeded Anaheim to the red pepper, even better. Sometimes if I’ve got feta lying around I make Moldavian potato salad, which I got out of David Carlton’s copy of Please To The Table sometime in grad school. (Looks like this recipe has been plagiarized here.) Anyway, I had a bunch of little CSA yellow potatoes tonight and felt like making this, but wasn’t in the mood for boiled potatoes. So instead I did it hash-style. 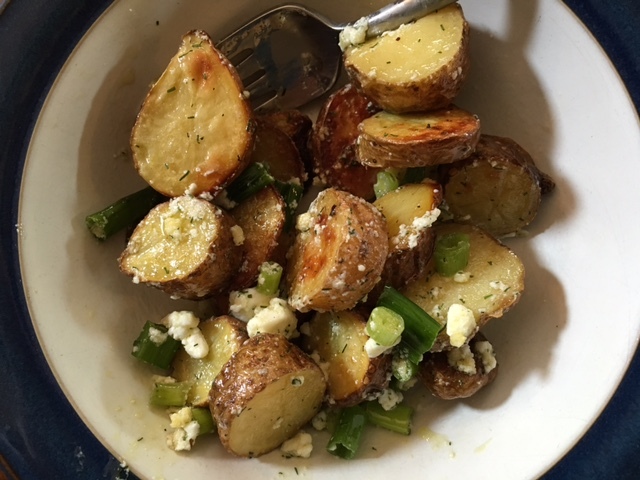 Diced potatoes, scallion, garlic, olive oil, dill (didn’t have fresh, used dried), salt pepper, in one layer on a baking sheet, feta crumbled on top. (Proportions can be found in the linked recipe but I didn’t follow these, just put in what looked good to me.) Roasted at 350 for, I dunno, a half hour, until feta nice and brown. I was going to dress it with a little more olive oil when it came out — it would also have been natural, I see now, to drizzle some lemon juice on it — but it was great just as it was. Procedure: put some olive oil in a pan, chop the apples and fry them with a little pepper. Throw the shredded cabbage on top of it and fry further. Put in some mustard and stir. Then toss a glug of red wine vinegar in the pan, cover, and let steam a few minutes. Good with chopped up turkey kielbasa in it.